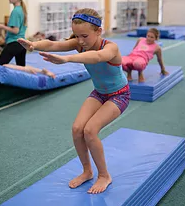 In our gymnastics programs, we offer opportunities for children to develop a positive outlook on physical fitness in a safe and fun environment. Strength, flexibility, balance, spatial awareness, and confidence are inherent in gymnastics training. At Mountain Kids, there is a progressive curriculum appropriate for every age. Classes are offered for toddlers (with mom or dad), preschoolers, school age children, and and students in middle and high school. 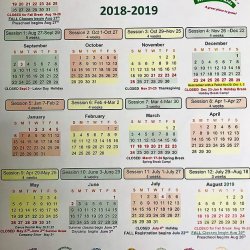 Our viewing area is open to parents at all times, so you can see and hear everything that goes on in your child’s class. 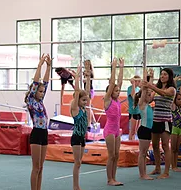 Our instructors are positive and enthusiastic; they have backgrounds in gymnastics and have chosen to share their love of the sport with the next generation! 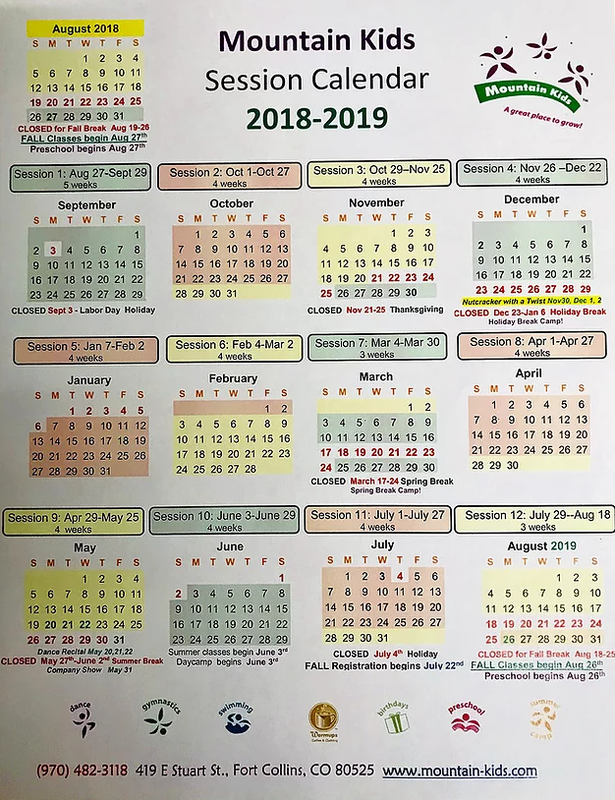 We accept enrollment for our gymnastics classes throughout the year. If you enroll in the middle of the session, it will be prorated for your convenience. Everyday is about exploration at this age, and this class provides plenty of adventures for little explorers and their parents! 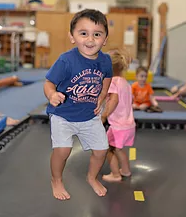 Our Moonbeamers gymnastics class offers a wide variety of movement activities, including obstacle courses, trampolines, the foam block pit, ball handling games, and music and rhythm in a non-competitive atmosphere. We combine ballet combined with our Rainbow Riders gymnastics class for a creatively themed introduction to both dance and gymnastics. It is a winning combo for preschoolers interested in trying both. What do you do with a busy preschooler? Bring them to gymnastics! The positive and fun environment we provide keeps children engaged and entertained. Gymnastics training inherently includes strength, flexibility, balance, spatial awareness, and confidence. Our enthusiastic staff — and creative weekly themes — help provide an excellent start to lifelong learning and fitness. Wed. or Thurs. 1:30–2:30 p.m. This class is for more advanced preschoolers or kindergartners who are ready to be challenged with higher level skills than the Rainbow Riders class. Wed. or Thurs. 9:00–10:15 a.m. The sport of gymnastics has much to offer the young athlete. 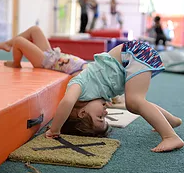 In addition to balance, strength, flexibility, overall coordination, spatial awareness, and self-confidence, gymnastics is also fun! Classes for girls are organized so that safety and fun combine for an optimal learning experience. Fundamental skills are taught at all levels in a consistent, progressive manner to provide success in gymnastics and other sports. 9:00–10:30 a.m. or 10:30 a.m.–12:00 p.m. 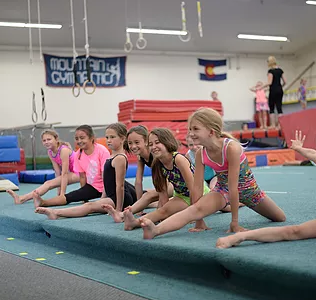 This class offers all the benefits of gymnastics — balance, strength, flexibility, overall coordination, spatial awareness, and self-confidence — in a class just for boys. 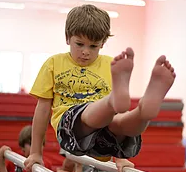 Gymnastics classes for boys are designed to combine safety and fun for an optimal learning experience. 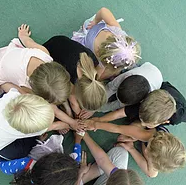 We teach fundamental skills at all levels in a consistent, progressive manner so students are successful in gymnastics, as well as other sports. 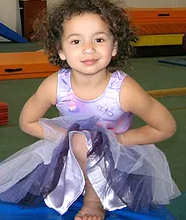 Mountain Gymnastics offers USA Gymnastics competition for girls and boys levels 4 through 10, and USA Acrobatic Gymnastics for both boys and girls. Since 1976, under the direction of Ron Baretta (former collegiate all-around champion, national level competitor, and CSU Hall of Fame member), the Mountain Gymnastics Teams have consistently fielded many state champions and qualified gymnasts to regional and national championships. Inquire for practice times. Please come to class with your hair tied back. For beginners leotards or comfortable workout wear are appropriate. For more advanced classes leotards and well fitted shorts or leggings are fine for girls and well fitted workout wear for boys is recommended. For all levels please avoid jeans, restrictive clothing, baggy clothing, jewelry and socks. Bare feet are best!